CCTV Hot Deals Summer Vacation Sale!! Summer Vacation Sale: Save up to 30% Off. No Coupon Code Needed. Offer Exp: 07/31/2014. And More Protect your home or business , and enjoy your vacation even more with our surveillance systems. Simple to set up and easy to use, this system allows you feel as if you were there even when you're far away. Get 4th of July Sale & Save up to 25% on Selected Items! Get 4th of July Sale & Save up to 25% on Selected Items! Shop Now. No coupon code needed. Offer Exp: 07/08/2014. 8CH 960H DVR 700TVL Security Camera System with 1TB HDD. Sometimes a full size 8 channel CIF or D1 resolution video recording system just isn’t quite enough. There are times you may want a larger, high quality resolution display & recording especially to present as legal evidence. This Zmodo 8 channel 960H Security DVR is a top of the line digital video recorder allowing you to view live, record and playback full screen video in real-time (30fps per channel, 240fps total) at D1 resolution. It also offers the option of high quality live viewing and recording, a 34% increase over standard D1 resolution and 500% over CIF. Coupled with 700TVL high resolution night vision cameras, this premium system offers a larger, sharper, undistorted image with a truer aspect ratio that enhances surveillance. So buy this 8 Channel 960H HDMI DVR + 700TVL Camera Security System From $249. Shop Now. CCTV Hot Deals June Promotions!! 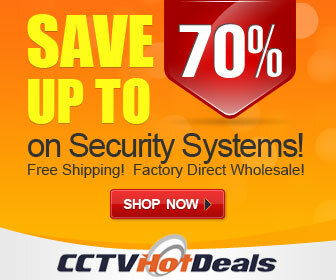 CCTV Hot Deals June Promotions!! 10% Savings on 600TVL CCD Camera Systems. With coupon code: CCDKIT10. Offer Exp. 07/03/2014. CCTV Hot Deals April Promotions!! CCTV Hot Deals April Promotions. Save Up To $30 OFF on Handpicked Security Systems. Offer Exp: 05/03/2014. Get Free Shipping on Zmodo 600TVL Vandalproof Security Camera Systems Start From $124.99. Weatherproof & Vandal-Resistant. Remote Connectivity. 80ft IR Night Vision. Zmodo 600TVL Versatile Camera Systems Start From $199.99. Plus Get Free Shipping. So shop now. Zmodo 960H Security Camera Systems Start from $239.99, 700TVL high resolution with easy remote access. Auto IR-Cut Filter. HDMI Port for High Resolution Viewing. Buy Now. All-in-One sPoE NVR Kit!! Now Only $399.99, Power over Ethernet, Quick Remote Access, 720P HD Real-Time. CCTV Hot Deals January Promotions - Get 10$ Off!! CCTV Hot Deals January Promotions!! Get $10 Off on Zmodo 960H HDMI DVR + 700TVL Camera Systems, Use Coupon Code: exclusive10 at checkout. Offer Exp: 2/03/2014. Shop Now. CCTV Hot Deals January Promotions - Get 5% Off!! CCTV Hot Deals January Promotions!! Get 5% Off on Zmodo 600TVL Sony CCD Dome Systems, Use Coupon Code: CCDkitpromo at checkout. Offer Exp: 2/03/2014. Shop Now. CCTV Hot Deals January Promotions!! CCTV Hot Deals January Promotions!! Save 10% on Zmodo 600TVL Versatile Camera Kits, Use Coupon Code: 600tvlpromo at checkout. Offer Exp: 2/03/2014. Shop Now. More about ZMODO Technology Corporation, Ltd.
CCTVHotDeals.com is a leading e-commerce company committed to becoming one of the largest marketplaces in the video surveillance industry by offering you an unsurpassed shopping experience, rapid delivery, and stellar customer service. At CCTVHotdeals.com, most products we sell here are directly purchased or imported from qualified manufacturers and we guarantee you the lowest prices in the industry. At CCTVHotdeals.com, we believe that true service starts after the product you ordered arrives at your doorstep.